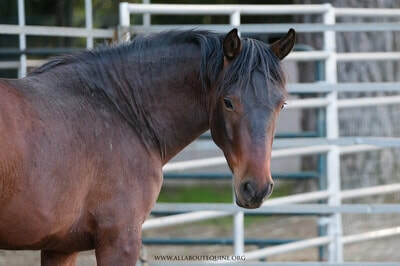 Handsome Diego was originally part of a group of mustangs gathered by the USFS in New Mexico off the Jarita Mesa Wild Horse Territory in the El Rito Ranger District of the Carson National Forest. 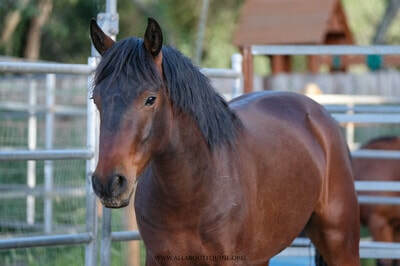 After being offered for adoption by the USFS at two adoption events, he was not lucky enough to be chosen. 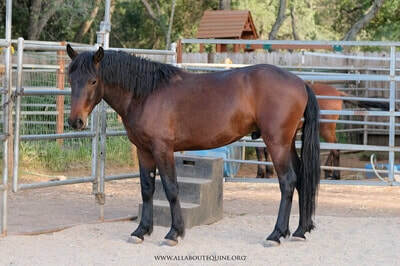 Diego, along with herdmates Scout, Diesel and several others, was taken to the Monty Roberts International Learning Center (MRILC) in Solvang, CA. While at the MRILC, they participated in the Center's wild horse gentling program where students come to learn Monty's methods. Several more were adopted, but not Diego, Diesel, or Scout. The USFS considered their stay at the MRILC as a third adoption event, and they earned their third strike. The USFS proposed placing them on Craigslist for $25 each; however, the instructor at MRILC knew the potential risk of kill buyers, especially being relatively close to Mexico, so reached out to AAE for help. So, the three boys came to AAE in late 2016 to continue their gentling and to learn about life as a newly-domesticated horse. Diego's buddies were much more willing to cross-over into the human world. Diego made some progress while here at AAE. Enough that he could be haltered, was finally gelded, and had a much needed hoof trim. Diego was making slow progress; however, Diego wasn't transitioning well into the human world. So, he went back to MRILC for another visit. While there, Diego had a little set back, but Monty saw something in this guy that most others didn't. Monty asked that he keep Diego to continue his learning, so Diego went back to Solvang to live with and learn from Monty. Click here to see a video of Diego with Monty.